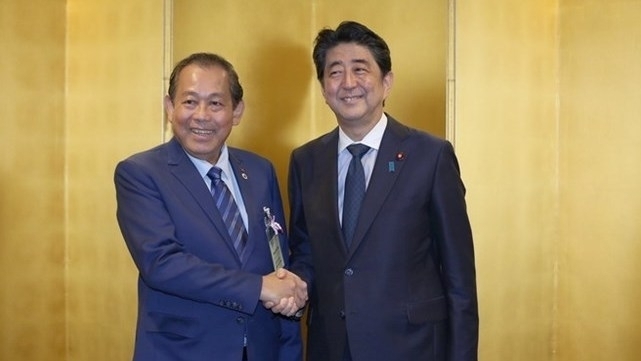 Deputy Prime Minister Truong Hoa Binh expressed his delight at the strong development of the Vietnam-Japan extensive strategic partnership while meeting with Japanese Prime Minister Shinzo Abe and Speaker of the House of Representatives Tadamori Oshima in Tokyo on June 11. The meetings were part of his visit to Japan to attend the 24th International Conference on the Future of Asia. Speaking highly of the cooperation and exchanges between the two Governments, parliaments and ministries in the past time, the Deputy PM said that both sides should coordinate closely at the World Economic Forum on ASEAN in September this year in Vietnam and the Mekong-Japan Summit Meeting in October in Japan. He recommended the Japanese House of Representatives maintain all-level exchanges and meetings with the Vietnamese National Assembly, particularly between young parliamentarians. Also, he lauded the Japanese Government for its continued ODA provision for Vietnam in the fields of human resources training and high-quality infrastructure, stressing Vietnam’s efforts in using the assistance in an effective and rational way. He suggested both sides promote experience sharing in legislation, court, e-government, public administrative reform, settlement of redundancies after reform, and application of industry 4.0 in administrative reform. It is vital for the two countries to enhance investment and people-to-people exchanges, bolster coordination and mutual support at regional and international forums like the Asia-Pacific Parliamentary Forum (APPF) and the Inter-Parliamentary Union (IPU), he said. For their part, the Japanese hosts thanked the Vietnamese official for attending the International Conference on the Future of Asia, expressing their elation over the development of the Vietnam-Japan relations. They affirmed that President Tran Dai Quang’s May 29-June 2 visit to Japan was very significant during the year marking the 45th anniversary of bilateral diplomatic ties. PM Shinzo Abe said that both countries need to join hands to carry out the agreements reached during President Quang’s visit, helping the bilateral relations develop in a more effective and practical manner. Meanwhile, Speaker Tadamori Oshima applauded the exchanges between the two parliaments, and Vietnam’s socio-economic and diplomatic achievements in the past years. Japan always attaches importance to further enhancing the cooperation with Vietnam and supports the country in its socio-economic development, he noted, lauding Vietnam’s active role in the signing of the Comprehensive and Progressive Agreement for Trans-Pacific Partnership (CPTPP). At a reception for Japanese Minister of Internal Affairs and Communications Seiko Noda, Deputy PM Binh hoped that the Japanese ministry will further its assistance for Vietnam in building e-government and administrative reform. Seiko Noda spoke highly of Vietnam’s public administrative reform while saying that Japan stands ready to support the Southeast Asian nation in the field. Meeting with President of the Japan International Cooperation Agency (JICA) Shinichi Kitaoka, the Deputy PM asked JICA to continue its backup for Vietnam in the construction of large-scale infrastructure projects. Shinichi Kitaoka affirmed that Vietnam is JICA’s important partner in the world, adding his organization’s support will focus on enhancing competitiveness, response to climate change, and improvement of State management capacity. He affirmed that JICA will do its utmost to contribute to the Vietnam-Japan relations.